Marcos Pontes, the first Brazilian astronaut to travel in space, was a guest speaker at Tech Valley High School on Oct. 4 in honor of World Space Week. 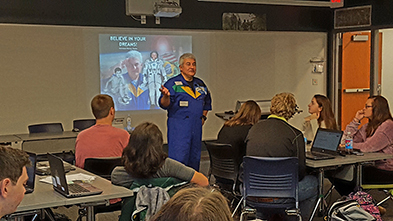 In honor of World Space Week, Tech Valley High School on Oct. 4 hosted guest speaker Marcos Pontes, the first Brazilian astronaut to travel in space. Pontes traveled to the International Space Station in 2006 with fellow astronauts from the United States and Russia. He spent several days there working on systems maintenance and conducting experiments on behalf of the Brazilian Space Agency. Pontes shared stories with TVHS students of his background, discussing how he became interested in space travel and the education and training required to become an astronaut. He answered questions about what life is like without gravity and the impact space has on the human body. Pontes, who retired from NASA’s active Astronaut Corps, is currently a researcher at the Institute for Advanced Studies at the University of Sao Paulo. He also serves as goodwill ambassador for the United Nations and as as brand ambassador for Integra Optics.